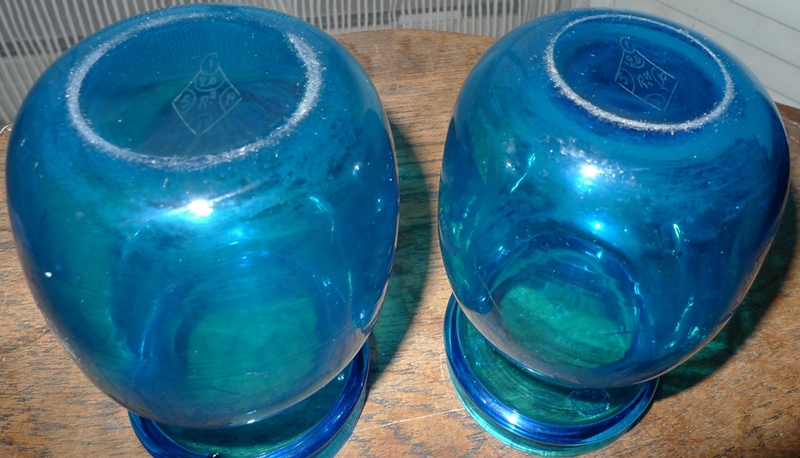 This colour has been called "Bristol green" as has the cobalt blue been called "Bristol blue". When vases were blown by hand they had a kick-up pushed into the bottom of the vase to ensure they would sit steadily on a flat surface. This kick-up (below) is one of the largest I have seen. This shape became very popular and was produced for many years (from the 19th century into the 20th century) in different colours and slight variations. They range from just under 14 cm tall to 14.5 cm tall. Tye vases date from the 1850s; it's one of the few Georgian/Victorian glass hyacinth vase that is actually marked by the manufacturer, having been moulded and stamped on the bottom. This is a Tye hyacinth vase, left and above, so named after the manufacturer George Piercy Tye (?-1879). It's a short, bulbous shape with a short rim. The short rim makes it easy to identify possible Tye vases and differentiate them from the many imitations but not all vases with a short rim are Tye; they are all marked on the bottom as well. Manufactured from 1850 for only about 10 years. Stamped on the bottom in a circle: "Gt Charles St, Birmingham" and in the middle: "G P Tye". Some also included "1850". 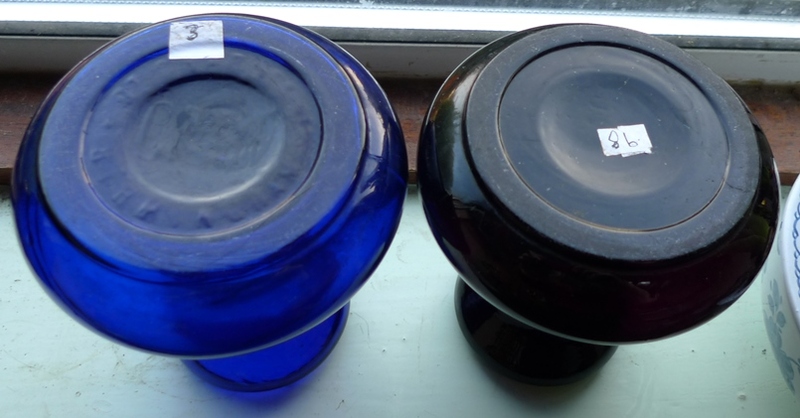 There were also vases manufactured with a stamp on the bottom with only "GP TYE" as shown on two vases I bought recently, below. The vase below right was inspired by or an imitation of the Tye vase on the left. Notice the much larger rim. More examples are below. Some hand-blown vases defy categorization as "tall" or "squat" and are something in between. The flattened round hyacinth vase shape is slightly later than the squat bulbous shape. Its cranberry colour was a very popular Victorian colour. 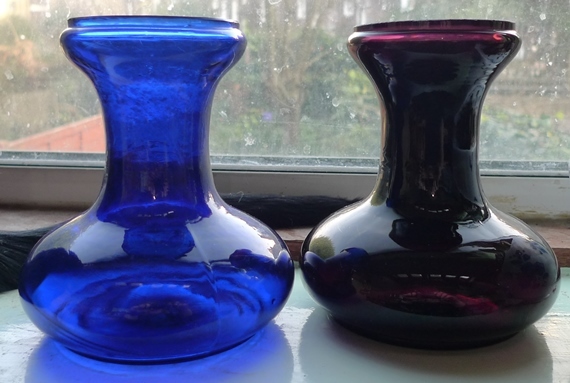 Another example of a flattened round hyacinth vase in cranberry, left, and in comparison with the other example and a round vase, below. A round hyacinth vase, left, and in comparison with the flattened shape, above, late Victorian. Sizes: the two round cranberry vases are 9 and 9.5 cm tall, the larger clear round vase is 11.5 cm tall, the amber teardrop 13.5 cm tall and the clear vase with the prongs is 10 cm to the top of the prongs. 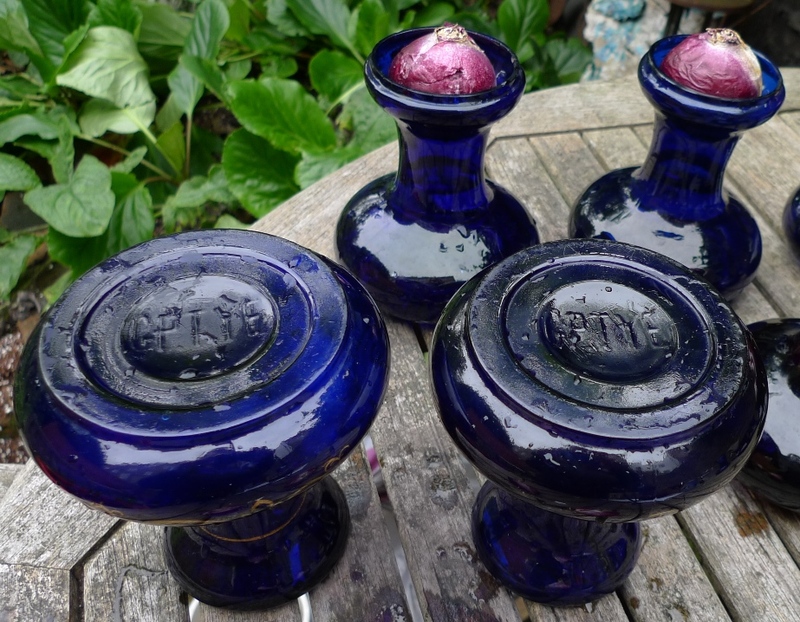 As far as I know these mould-blown vases are Scandinavian and have a wide date range from late 19th century to quite modern examples. I'm not even sure what these are called. I say "x-shape" in the absence of any other name and I can't remember if I heard that somewhere else or thought of it myself. 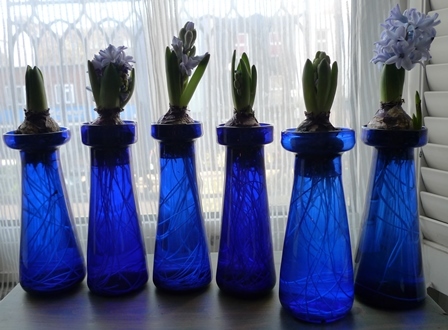 The clear vase (very badly water stained) is 19 cm tall, the green one is 23 cm tall and the blue one is just under 22 cm tall. Wide range of dates and quality, produced from the 19th century into the 20th century. 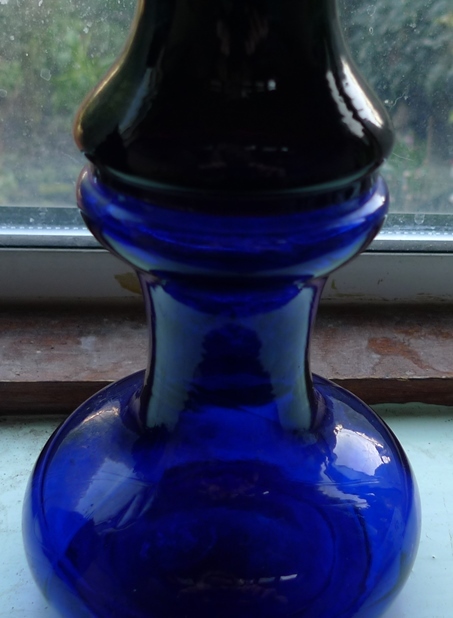 This one is one of the older Victorian examples, hand-blown with a snapped off pontil. 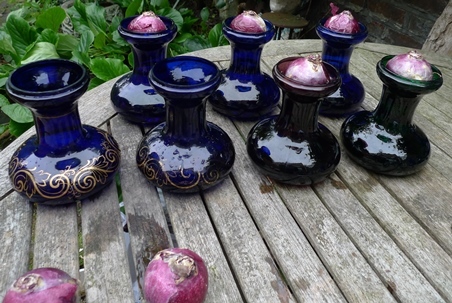 A number of vase shapes are suitable to hold a bulb above water although they were not made as bulb vases. 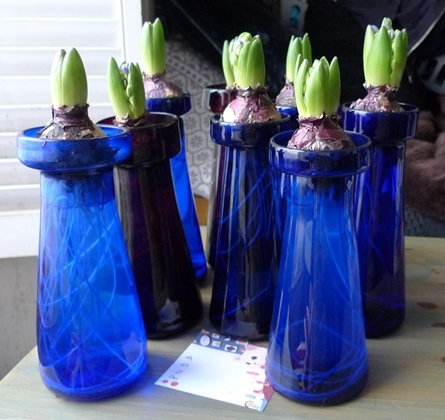 I don't think this one is an "official" bulb vase but I don't care! It looks beautiful with a hyacinth even if it's not "official". The hyacinth vase on the left is that yellowish-greenish colour of uranium glass manufactured in the first half of the 20th century. I think it's from Rimac, shape called "Fancy". The smaller green vase on the right (from a Dutch company whose name escapes me right now) is a similar shape but is less reactive under UV.